Had a light Breakfast of a Healthy Life Whole Grain English Muffin topped with I Can’t Believe It’s Not butter and a cup of Bigelow Decaf Green Tea, After Breakfast I headed to Meijer. I had went a couple of days ago and they had Walleye on sale, which we had last night. It was some of the freshest and best tasting Walleye we had ever had! So I went back up to Meijer to pick up a couple of more fillets that I’ll be putting in the freezer. Back home I did a little house cleaning inside and leaf cleaning outside. After that I got the cart out to enjoy another perfect Autumn Day. Sunny and 70 degrees, perfect! For dinner tonight I prepared a Ham and Swiss Wrap w/ Cream of Tomato Soup. Sandwich and Soup just sounded good for a cool Autumn’s Day. So I prepared a Ham and Swiss Wrap w/ Cream of Tomato Soup. To make the Wrap I’ll be using Boar’s Head Maple Glazed Honey Coat Ham, Sargento Ultra Thin Swiss Cheese, Private Selection Sweet Hot Stone Ground Mustard, Lettuce and Flatout Foldit Artisan Flatbread – 5 Grain Flax. All this comes together to make one delicious and healthy Sandwich! 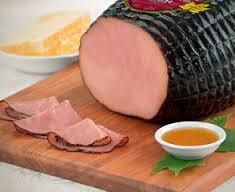 I used my favorite Ham, Boar’s Head Maple Glazed Honey Coat Ham. Just love the taste of this Ham. Also used 2 slices of Sargento Ultra Thin Swiss Cheese, 40 calories a slice. Then I topped it with Lettuce and Kroger Private Selection Sweet Hot Stone Ground Mustard. 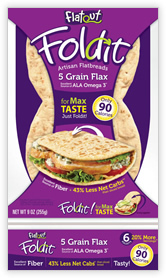 I use the Flatout Foldit Artisan Flatbread – 5 Grain Flax quite often for lunch, love this with the Flax and 7g of Fiber! These are always so fresh and they several different types. I find them at Meijer, Walmart, and Kroger (Limited Types). For my Soup I used Amy’s Organic Creamy Tomato Soup. My favorite Tomato Soup by far. I’ve been using this a couple of years now. Creamy with a fantastic flavor and it’s 110 calories and 19 carbs. I also had an ice-cold Diet Dr. Pepper, that I had put in the freezer for about 12 minutes, to drink. For dessert later a Healthy Choice Dark Fudge Swirl Frozen Greek Yogurt. A sweet treat that is nutritious and delicious. This ham has 100% pure maple syrup and golden honey baked right in, making it a great choice for sandwiches and salads alike. 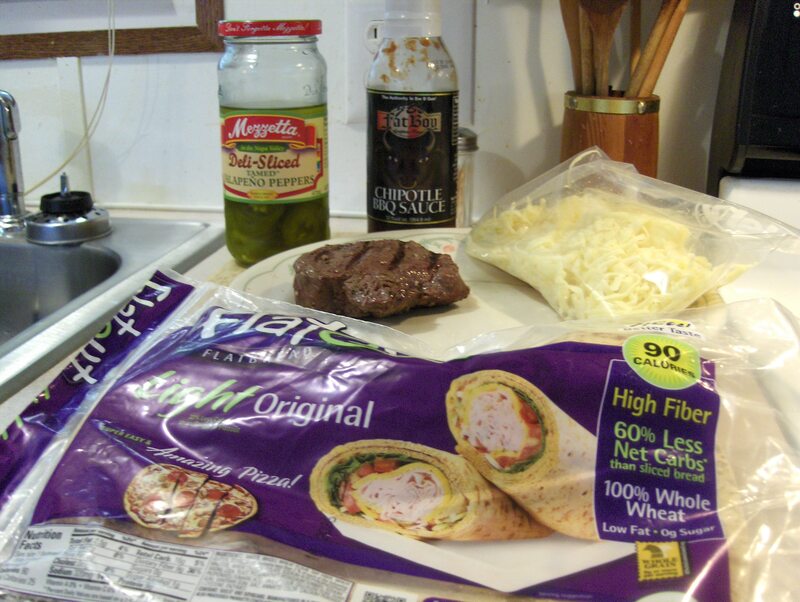 I used the leftover London Broil from the other day and I had the begining of some fantastic Wraps! I sliced the remaining London Broil into thin slices and wrapped them in paper towels and warmed them up in the microwave. For the Wrap I used Flatout Light Italian Flat bread. Love these they are 100% Whole Wheat , High Fiber, and only 90 calories and 16 carbs, I left the info and web link at the end of the post. I topped the Steak with JB’s Fat Boy Chipotle Sauce, sliced Deli Jalapenos, sliced Black Olives, Lettuce, Daisy Reduced Fat Sour Cream, fresh Grated Havarti Cheese and fresh grated Smoked Dutch Gouda. After assembling the wrap and folding it I put it in the microwave for 35 seconds. 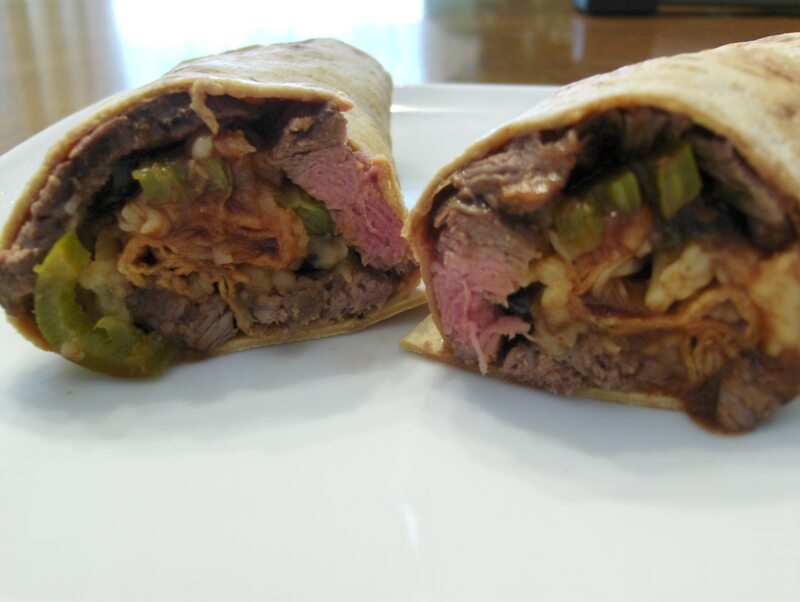 The lean and delicious Steak along with heat of the Jalapenos, Chipotle Sauce, and the fresh and creaminess of the Smoked Gouda Cheese and Havarti Cheese just makes an unbelievable Wrap! For dessert later a Mango-Cheesecake Parfait that I had made yesterday. You can find the recipe for this on an earlier post from today. INGREDIENTS: WATER, WHOLE WHEAT FLOUR, OAT FIBER, WHEAT GLUTEN, SOYBEAN OIL, contains less than 2% of each of the following: MALTITOL, WHEAT PROTEIN ISOLATE, SODIUM ACID PYROPHOSPHATE, BAKING SODA, YEAST, PRESERVATIVES (POTASSIUM SORBATE, SODIUM PROPIONATE, SORBIC ACID), FUMARIC ACID, WHEAT FLOUR, CELLULOSE GUM, GUAR GUM, CALCIUM SULFATE, XANTHAN GUM, SALT, ANNATTO COLOR, CALCIUM PEROXIDE, L-CYSTEINE, ENZYMES.CONTAINS: WHEAT AND SOYBEANS. MANUFACTURED IN A FACILITY THAT ALSO PROCESSES PRODUCTS CONTAINING MILK AND CHEESE. There are 90 calories in a 1 flatbread serving of Flatout Light Italian Herb Flatbread. I had a Chipotle Bison Wrap for lunch today. I used the other Bison Sirloin I had grilled the other day for the Wrap. After warming I sliced thin and layered it on the Wrap. For the Wrap I used Flatout Light Original Flat bread. Love these they are 100% Whole Wheat , High Fiber, and only 90 calories and 16 carbs! I topped the Bison with JB’s Fat Boy Chipotle Sauce, sliced Deli Jalapenos, sliced Black Olives and fresh grated Smoked Dutch Gouda. Unfortunately I was out of lettuce which would have went great with this. After assembling the wrap and folding it I put it in the microwave for 35 seconds. 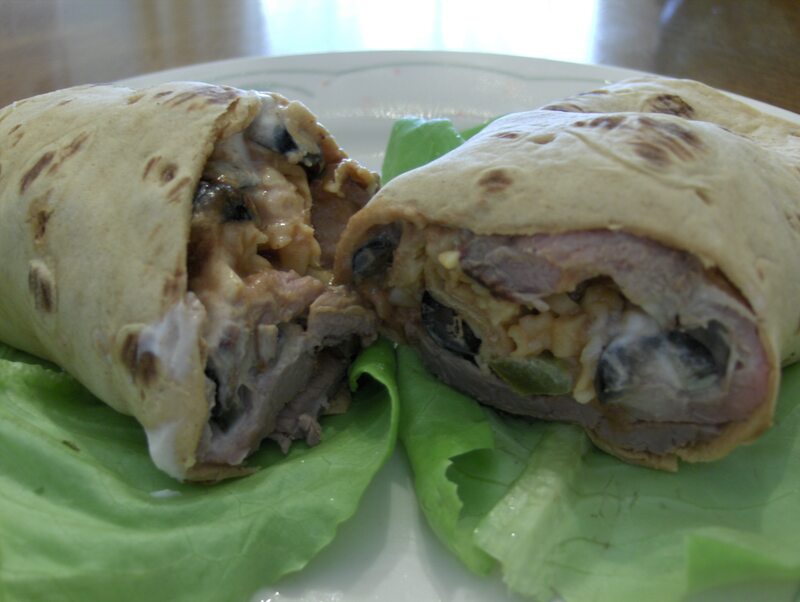 The lean and delicious Bison along with heat of the Jalapenos, Chipotle Sauce, and the fresh and creaminess of the Smoked Gouda Cheese just makes an unbelievable Wrap! Gotta Love That Bison! I had a Ground Bison Sirloin Burger for dinner tonight. I seasoned it with McCormick Grinder Steakhouse Seasoning and pan fried it in Extra Virgin Olive Oil about 4 minutes per side, medium rare. 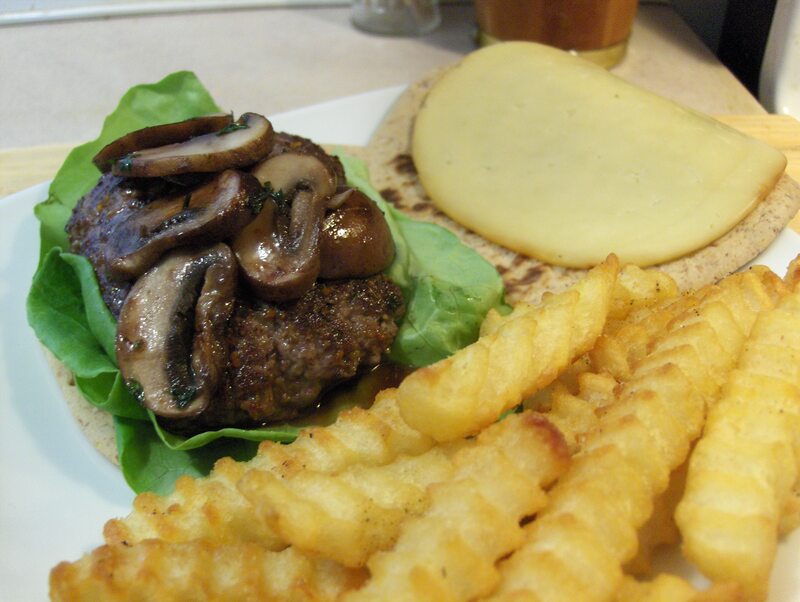 I topped it with Sauteed Baby Bella Mushrooms that were seasoned with Sea Salt, Ground Smoked Cumin, and Parsley. Also topped it with a slice of Smoked Gouda Cheese and Lettuce. Served on a Flatout Foldit Flatbread. I usually use these for when I make a Panera Sandwich but decided to use it with the burger. These are great for any use, their 100% Whole Wheat w/ Flax. Only 90 calories and 15 carbs. For sides I baked some Ore Ida Crinkle Fries that I seasoned with Sea Salt and Ground Black Pepper. Then for dessert/snack later a 100 calorie Jolly Time Mini Bag of Pop Corn. 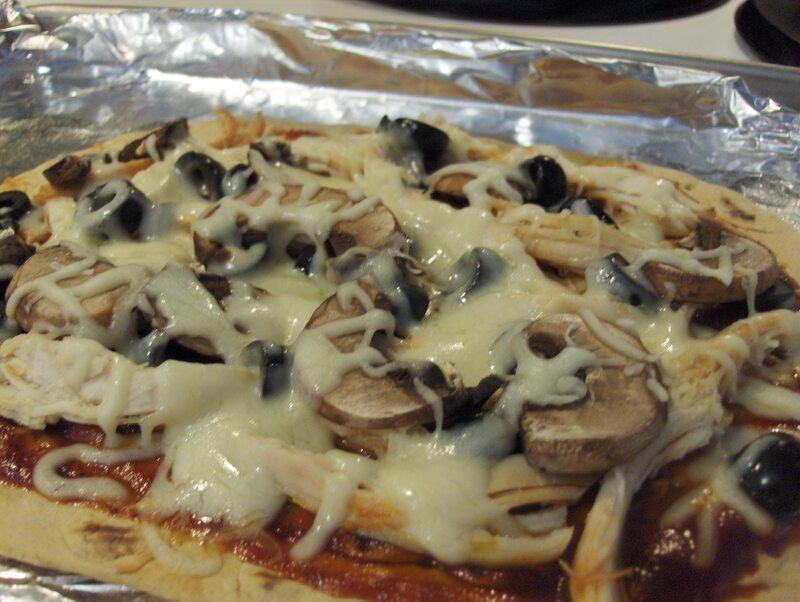 Thin Crust BBQ Chicken Pizza! Pizza Night! Thin Crust Low Carb Pizza night! I used Flatout Light Flatbread for my Pizza Pie. I used a Rotisserie Chicken I had purchased from Walmart and pulled all the Chicken and shredded it. In the oven after lightly oiling the Flatbread I heated it at 350 degrees for 7 minutes. 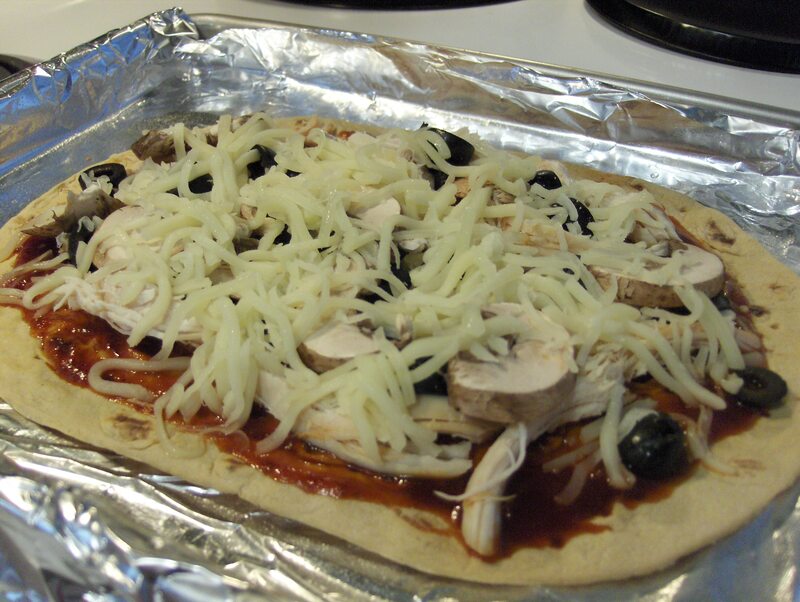 Then removing it from the oven I added my ingredients: J B‘s Sticky Stuff BBQ Sauce, Chicken, Black Olives, Mushrooms, and Pizza Cheese. Back into the oven for another 7 minutes and then served! The Chicken with the J B’s Fat Boy Sticky Stuff BBQ Sauce is a delicious combo and the Flatbread makes a fantastic thin crust pizza. For dessert/snack later some Townhouse Flip It Crackers topped with Sargento Ultra Thin Swiss Cheese and Hormel Turkey Pepperoni. Cook lightly oiled Flatout in 350°F oven directly on grate for 7 minutes. Remove, top with all ingredients. Return to oven and cook 7 more minutes. Cut into slices and enjoy! Serves 2. Had a healthy and delicious lunch this afternoon. I had a Chicken Breast leftover from the other night so I warmed it up for my wrap. I then sliced it into thin pieces and placed them in the wrap. The wrap I used was a new one and one I’ll be using quite often from now on, the Flatout Light Flatbread. It’s 100% Whole Wheat and it’s only 90 calories and 16 carbs! These would make a great Thin Crust Pizza, looking forward to making that. I left the link and info for the Flatbread at the end of the post. 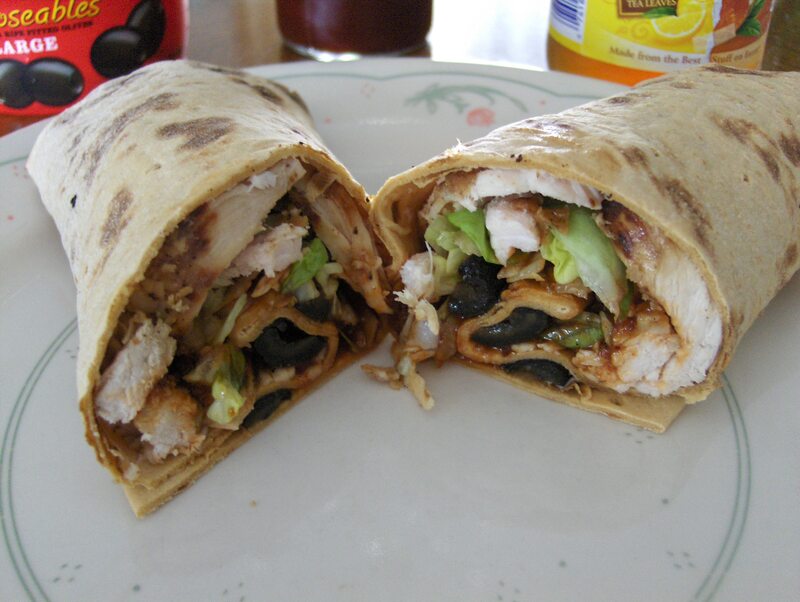 I added Fat Boy J B’s Sticky Stuff Sauce to the Chicken to give that delicious BBQ taste and added Shredded Lettuce and sliced Black Olives also. This made one delicious lunch!